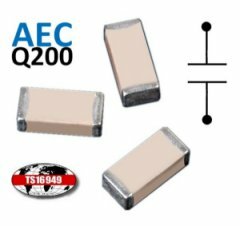 NIC Components is pleased to announce the addition of NMC-A series of AEC-Q200 qualified ceramic chip capacitors to its’ expanded family of automotive grade components. The NMC-A series is produced at TS-16949 certified production site, on production lines dedicated to automotive component manufacturing. Quality initiatives include tightened process controls (casting, printing, and dicing) for improved margin control, and higher level test and inspection, to assure high quality components for automotive applications. Supported in 0402, 0603, 0805, 1206 and 1210 case sizes, in ultra-stable NPO and high capacitance X7R temperature coefficients (TCCs), with operating temperature range of -55°C to +125°C, the NMC-A series meets AEC-Q200 Grade ‘1’ requirements. Capacitance range of 0.5pF to 1.0uF is supported in range of tolerances covering precision ±0.05pF (A) to ±5% (J) in NPO, to wider ±10% (K) and ±20% (M) in X7R TCC. NMC-A series extended voltage ratings, from 10VDC to 630VDC, are ideally suited for use in higher voltage applications, such as ballasts for HID lighting. Supplied packaged on carrier tape for automated pick and placement, and compatible with both legacy and Pb-Free soldering processes. NMC-A series is RoHS compliant with unit pricing ranging from $0.02 to $0.09 each. Please contact NIC for evaluation samples, and to review your requirements.